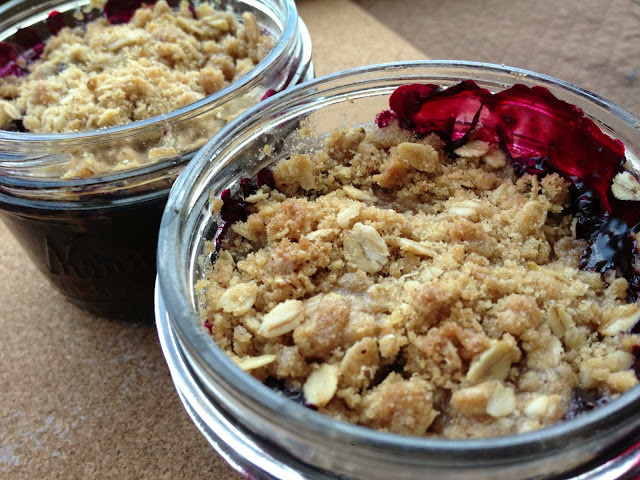 This recipe is the marriage of two great things: a really easy, super-versatile dessert recipe - and the amazing convenience (not to mention cuteness) of storing/cooking/freezing/serving in mason jars. 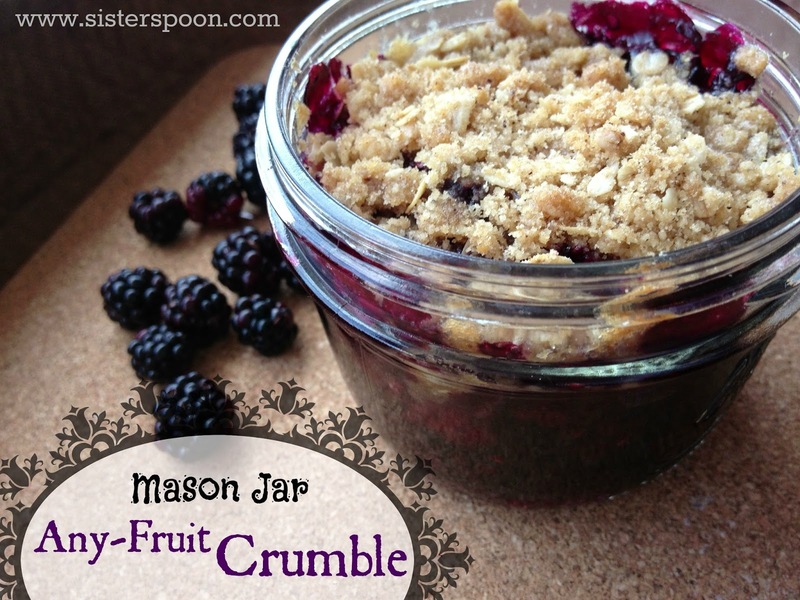 The recipe can be made in a 9x13 pan, or in 8 half-pint, wide-mouth mason jars. You can freeze before cooking. Then, when you want a dessert, put the frozen jars in the cold oven, turn on the oven, and bake. 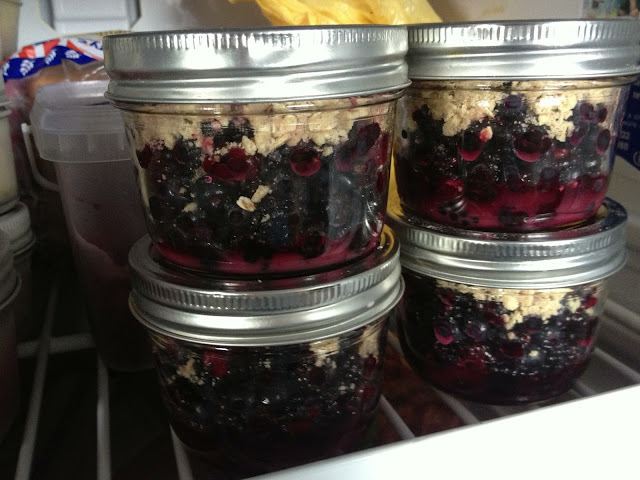 If you go with the mason jars, and freeze them, it's really easy to pull out however many servings you want. Super convenient! If you have a stash of these on hand (more mason jar dessert recipes to come), you can easily just pull out a few jars and stick them in the oven while eating dinner, and by the time dinner's over, dessert is ready to go. No worry, no planning, no extra work. Only use canning jars for this. Regular jars might shatter in either the freezer and/or the oven. You can use any fruit or combination of fruits for this recipe. The fruit can be fresh or frozen. I have used apple, pear, cherry, peach, plum, nectarine, apricot, and all kinds of berries. Definitely serve warm with ice cream. Yummm. I often make a batch of just the topping and keep it in the freezer. 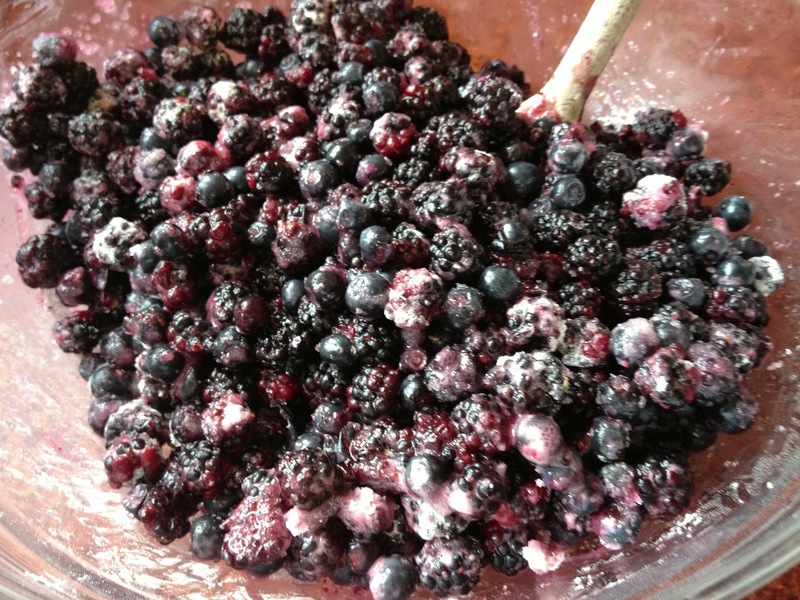 Then any leftover fruit gets mixed with cornstarch and sugar, and I sprinkle the topping on and pop in the freezer. Instant dessert, ready to go. You can get these jars on Amazon: I use Kerr brand. Link here. They are cheap, and yes, I got them to Ukraine in my luggage (packed carefully in the middle of my clothes). It was so worth it - I use them all the time! First choose your fruit. 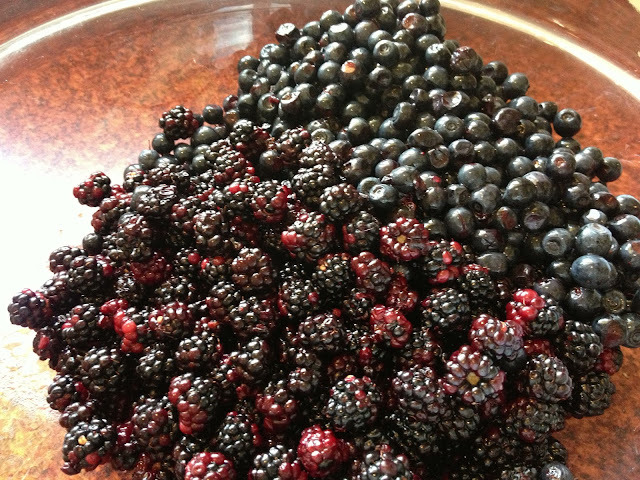 Today I had a big bag of blackberries that I couldn't pass by in the market, and also some fresh blueberries needing to be eaten. 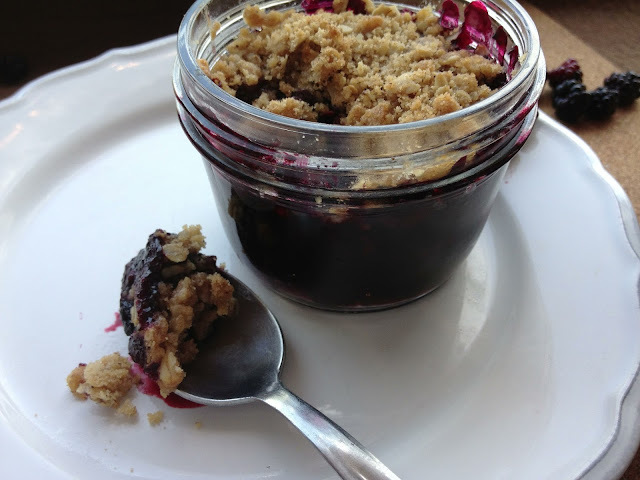 So I decided on a black-and-blue crumble today. But you can use any fruit you'd like. Go crazy. Now dump in your starch and sugar. Stir it all up. Gently. I'm sure there is some clever way comment I could make about not making my black-and-blue crumble all black-and-blue, but I've only had one cup of coffee today. Cleverness not happening. Just be nice to your fruit. Divide your fruit filling between 8 half-pint mason jars (or dump into a 9x13 pan if you prefer). But the jars are just so dang cute, aren't they? I mean really. 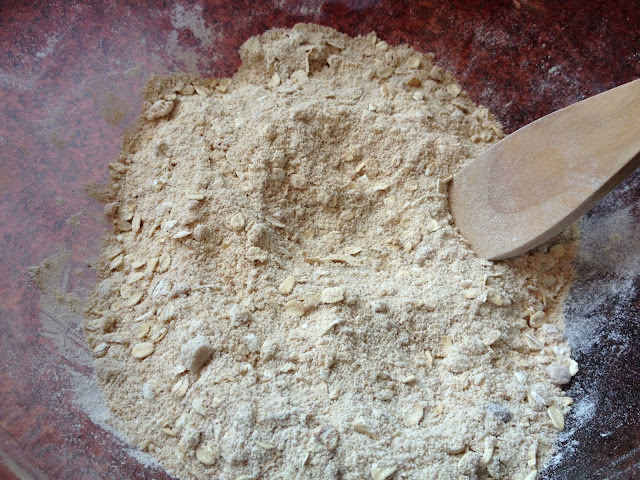 Now, in a clean bowl, measure out the flour, brown sugar, oats, and cinnamon. 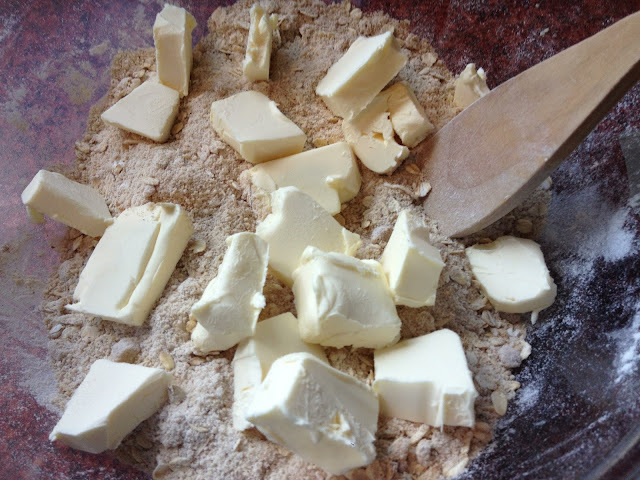 Add the butter in chunks. Cut the butter in with a pastry blender or your fingers. Add crumble topping to each jar. (Or spread over your 9x13 pan evenly). At this point, you can put the lids on and freeze, uncooked. 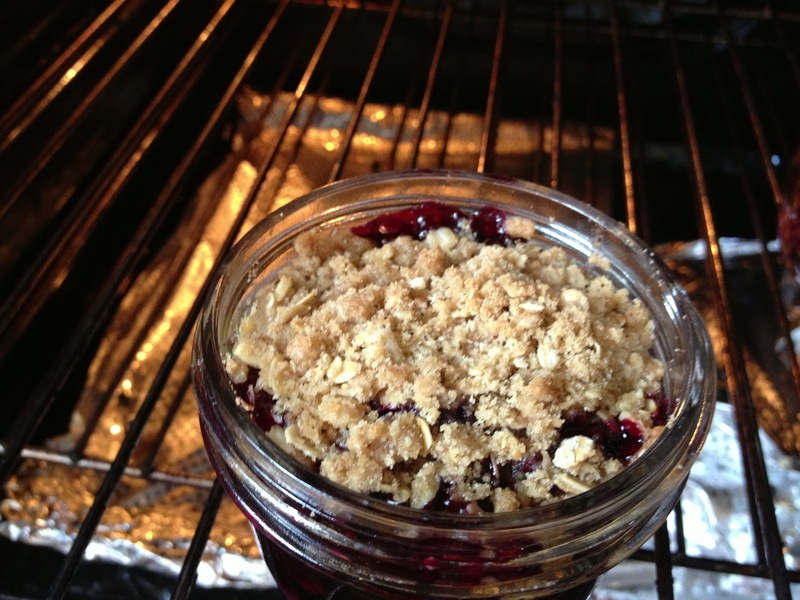 Then when the craving for dessert hits, just pop a jar in the oven (lid off), then turn on the oven and bake. OR... you can go ahead and bake and eat now. You know it's done when the juices get thick and bubble up through the topping. If it's still liquid-y it's not done yet. Now serve up that yummy, warm goodness in the cute little jars. 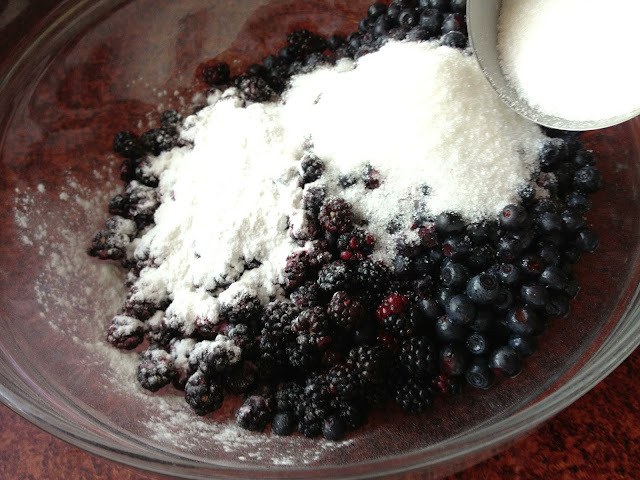 Mix fruit with sugar and starch. 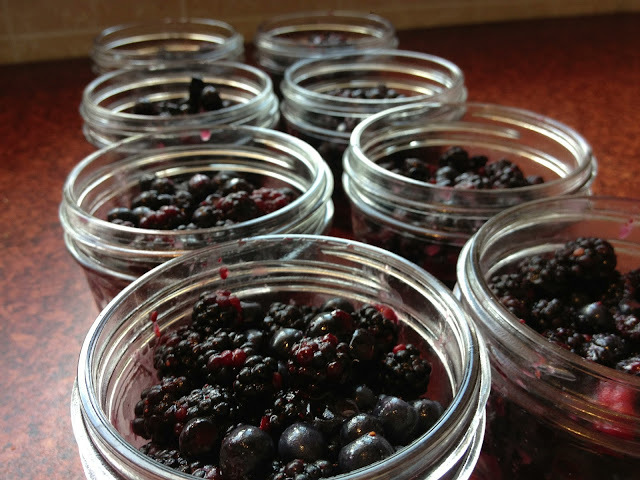 Pour into a 9x13 pan OR divide between 8 wide-mouth, 1/2 pint mason jars. (You'll use about 1/2 cup - 2/3 cup of fruit per jar). 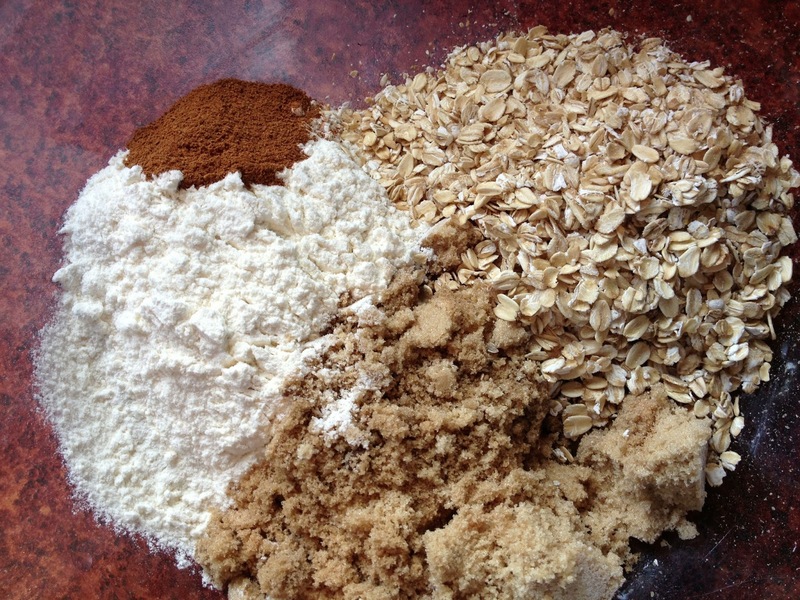 In another bowl, stir together the flour, brown sugar, cinnamon and oats. Cut in the butter. Sprinkle the topping onto the fruit. (you'll need about 1/4 cup per jar). 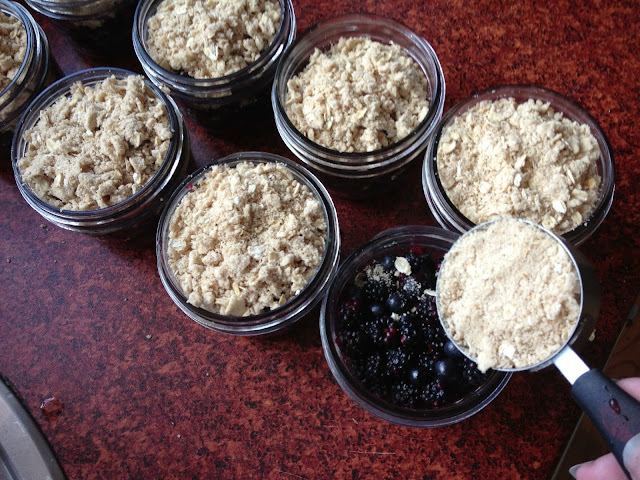 Optional step: Seal the jars and freeze. To bake, place pan or jars (without lid) in the oven. If they are frozen, they can be placed directly in the cold oven, and as the oven heats up, the jars will thaw somewhat. If not frozen, go ahead and bake in preheated oven 350F (175C). Cooking time will vary depending on whether or not it's frozen, which fruits you are using, and whether you have a pan or jars. Start with about 35 minutes, but keep cooking until the juice thickens and starts to bubble, possibly up to 50 minutes. I love your step by step illustrations. These look wonderful, gonna make some for my grandchildren.